Description: Nursing Care at the End of Life: What Every Clinician Should Know should be an essential component of basic educational preparation for the professional registered nurse student. 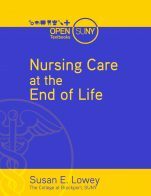 Recent studies show that only one in four nurses feel confident in caring for dying patients and their families and less than 2% of overall content in nursing textbooks is related to end-of-life care, despite the tremendous growth in palliative and end-of-life care programs across the country. The purpose of this textbook is to provide an in-depth look at death and dying in this country, including the vital role of the nurse in assisting patients and families along the journey towards the end of life. There is an emphasis throughout the book on the simple, yet understated value of effective interpersonal communication between the patient and clinician. The text provides a basic foundation of understanding death and dying, including a brief historical examination of some main conceptual models associated with how patients cope with an impending loss. An overview of illness trajectories and models of care, such as hospice and palliative care are discussed. Lastly, the latest evidence-based approaches for pain and symptom management, ethical concerns, cultural considerations, care at the time of death, and grief/bereavement are examined. The goal of this text is to foster the necessary skills for nurses to provide compassionate care to individuals who are nearing the end of life and their families. Every chapter contains a “What You Should Know” section which highlights and reinforces foundational concepts. Reviewers: As part of the release of these new open textbooks, BCcampus is actively soliciting reviews by qualified faculty from British Columbia, Alberta, Saskatchewan, and Yukon. If you would like to review this textbook, please contact us. We provide a $250 stipend to faculty who review a BC open textbook.